Devoid Of Culture And Indifferent To The Arts: We’ll soon be foraging! 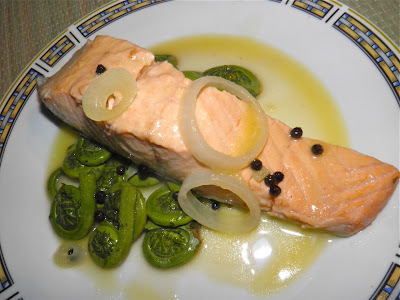 I can't wait... Fiddleheads and butter poached salmon. Some time this weekend I’m going to take my first tentative steps into the wilderness. It’s been a long sleepy winter and this old bear has finally roused and gone in search of food. Oh wait – I’m not a bear... I just growl quite a bit. But I still need food, and the time is soon upon us where we can start to get some free stuff from Mother Nature’s cupboard. Yesterday my spouse did our first lawn mowing of 2013 at our place. Today I will do the same for my mother, so things are definitely growing. It has begun. There’s two early spring foods that are available now, or soon will be in Nova Scotia. One is the dastardly dandelion, the other is fiddleheads. 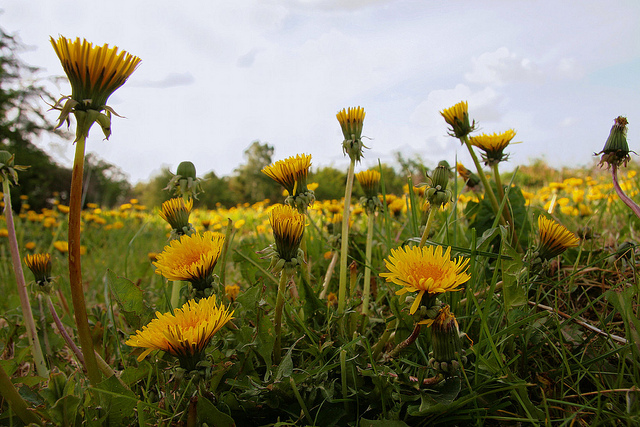 Regarding dandelions, I am of the school that believes if you can’t defeat your enemies you should eat them. Seriously. Dandelion greens are really good. Yes – the ones that grow out of your lawn. I have often looked at the ones in grocery stores and wondered what the heck they are. They bear slight resemblance to our golden-headed “friend” and I have never bought them. I’m sure they’re someone’s dandelions. but not the common one in Nova Scotia. When I’m mowing today I will be checking progress. The other forageable (is that even a word?) 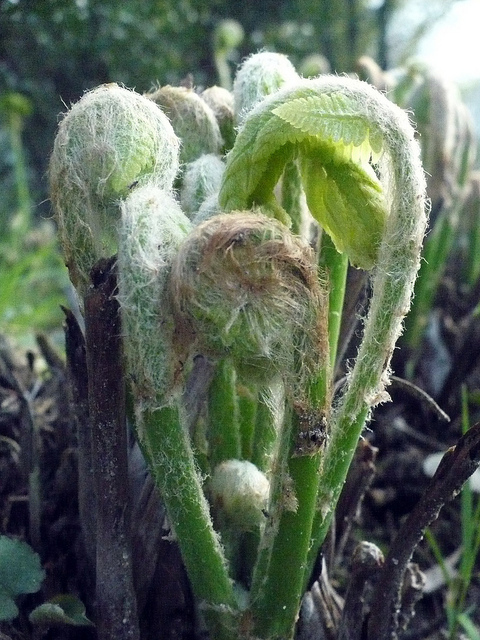 soon to break ground will be fiddleheads. The ones you get in the store, if you don’t happen to have a fen nearby, are exactly what grows wild. They mostly come from New Brunswick, but can be found everywhere in Nova Scotia if you care to look. Fiddleheads, also known as ostrich ferns (Matteuccia struthiopteris), grow wild in wet areas of northeast North America in spring. Many ferns contain the enzyme thiaminase, that breaks down thiamine. That's highly undesirable. This can lead to beriberi and other vitamin B complex deficiencies if consumed to excess or if your diet is lacking in these vitamins. I’ m assuming that excessive consumption would be a few times a week. For a truly springtime feast, pair fiddleheads with fresh-caught brook trout. I do my best fishing at the grocery store, but the day I made this they didn’t have any trout. 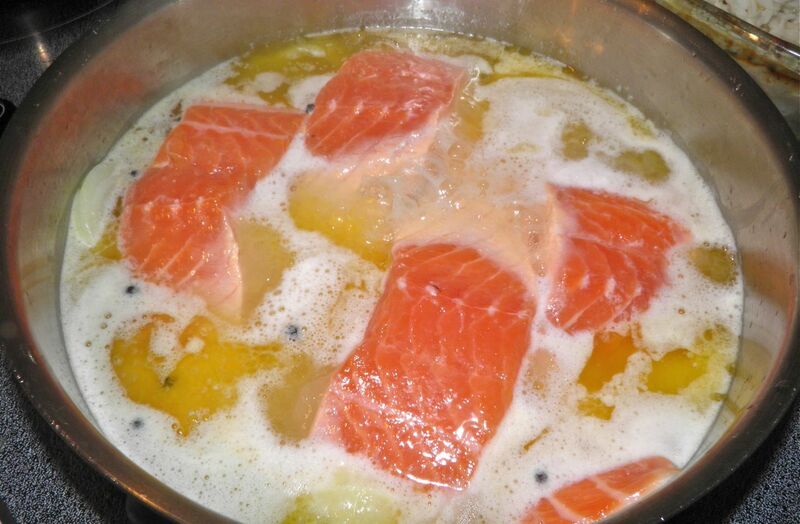 When I made this salmon was on sale so I had to make do… poor me. 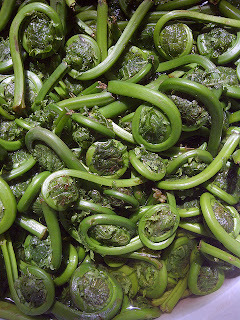 To serve, divide the fiddleheads onto individual plates. Top with a piece of salmon and drizzle with the reduced sauce, onions and peppercorns. Sprinkle the fish with a little large grained sea salt.